Hazrat Mirza Masroor Ahmad makes remarks during interview with Dutch media outlet De Correspondent. 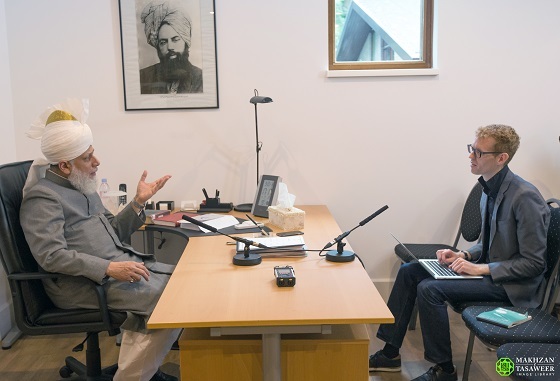 On 9 October 2015, the World Head of the Ahmadiyya Muslim Community, the Fifth Khalifa (Caliph), His Holiness, Hazrat Mirza Masroor Ahmad was interviewed by the Dutch media outlet De Correspondent at the Baitun Noor Mosque complex in Nunspeet, Holland.During the interview, His Holiness said that the peaceful interpretation of Islam advocated by the Ahmadiyya Muslim Community was not a reaction to the violence and conflict witnessed today, rather it was based on the teachings and guidance of the Founder of the Ahmadiyya Muslim Community. Share the post "“Governments should take firm measures against extremist clerics”"